So what do you do with all of the wonderful rendered fat from the roasted duck? You didn't throw it away did you? 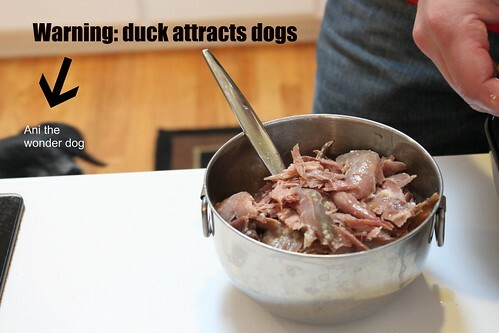 Rendered waterfowl fat is one of the most delicious cooking mediums out there. One of the tastiest dishes that can be made with it is Confit Canard also known as Duck Confit. 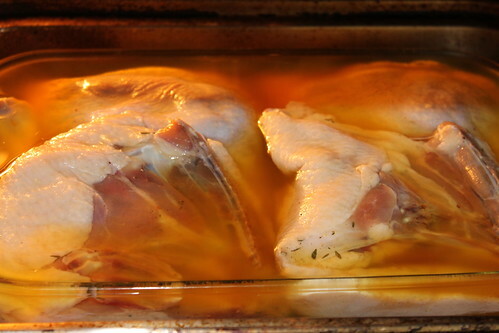 Confit is a term that is usually applies to meat that is slowly cooked submerged in fat. Is it healthy? Absolutely not. It is, however, delicious and not in the least bit greasy despite the cooking method used. 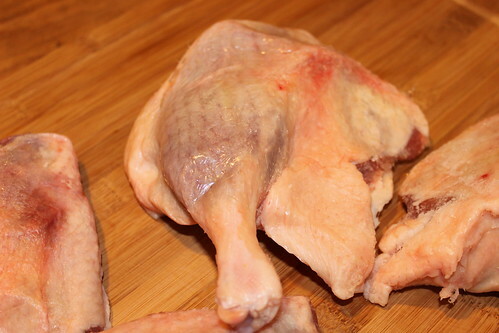 For duck confit you need the the leg, thighs, and fat of a duck. You can buy whole ducks and butcher them, reserving the breast for other use or buy the legs on their own. In Columbus, both whole, parts, and fat can usually be found at North Market Poultry and Game in the North Market. Once you have the legs, trim of any excess skin and pat them dry. 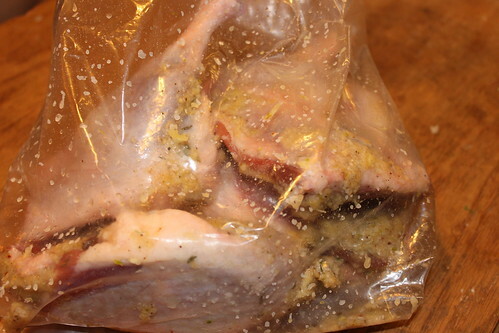 Coat them in a mixture of kosher salt, chopped garlic and thyme and let them rest refrigerated for at least 12 hours. After the resting period, rinse the legs in cold water and again pat them dry. 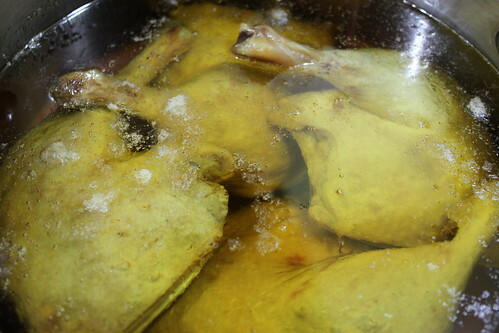 Place them in a shallow pan and fill the pan with enough rendered fat to cover the legs. Michael Ruhlman advises that you can use a mixture of 50% fat (any combination of poultry fat) and 50% olive oil. By our experience he is absolutely correct, and the end result is just as flavorful. After covering the legs in the fat, place the roasting pan in the oven on 200 degrees and let it cook. The process can take up to 12 hours and can be completed overnight if you wish. You will know the cooking is finished when the meat pulls easily away from the bone of the leg. Traditionally at this point you would let the meat cool underneath a layer of fat and store it refrigerated for many months as a preserved food product. It is ideal to let confit rest for at least a week to fully develop its flavor but even a few days will do if you are in a time crunch. After this fat nap, the meat can be used in many ways. 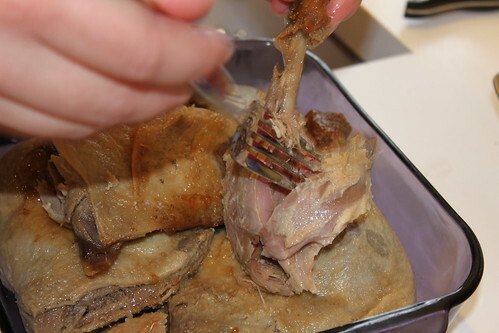 If you warm the fat back up, you can remove the legs easily, pat them dry and shred the meat from the bone. This can then be used to top toast points, make a creamy spread or as a salad topper. An alternate treatment is to reheat the leg whole in a saute pan and serve it as a main course. 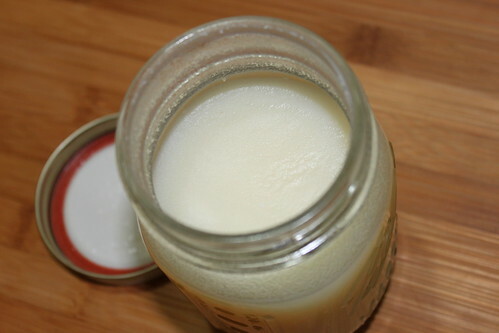 The fat you cooked it and stored it in can be strained and re-used multiple times; there is no need to throw it away. 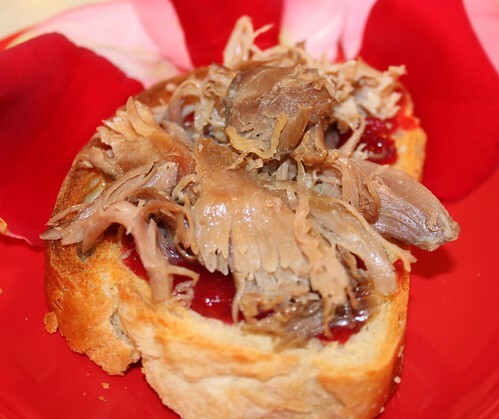 For a Rose Bowl party this evening, we served the confit pulled over cranberry sauce on toasted homemade bread. Guests loved eating it and watching the Ohio State Buckeyes cook the Oregon Ducks! This post was co-written with Alex. In the interest of research, even vegetarian Rachel tasted and enjoyed the confit.